Last year (or just a few weeks ago), the subject of time management and embroidery came up repeatedly in my inbox. I mentioned it briefly here on the blog and got lots of response, asking for me to cover the subject. 1. Time management is a huge topic, and lots of sub-topics fall underneath it. 2. What works for one person when it comes to time management is not necessarily going to work for another person, because everyone’s circumstances are different. 3. I am not the best example to follow when it comes to time management. Yes, I have certain tricks – more like rituals – that I go through, to help me manage my time and make sure I get my work done, but, like anyone, I tend to slip up and fall off the wagon now and then. So I’m plagued with self-doubt when it comes to sharing ideas about a lofty subject like how to manage your time! 4. Time management is not quite the same thing as organization (although organization has a lot to do with time management), and when it comes to embroidery specifically, I think it’s more a question of organization than actual time management. So today, I thought I’d share with you some ideas on managing embroidery projects, especially if you are the type of personality that needs to have a lot of things on the go at once. This is a much more specific topic than “time management,” and perhaps the ideas we share here (and in the comments below) will be more of a direct help to those of us who stitch and who want to have time to stitch more often. The photo above features the Epicenter of My Embroidery World. It represents the Stuff Getting Done. While I do have a workroom where my supplies are (more or less) stored and organized, when it comes to actually getting needlework done, the basket in the photo above is It. In that basket are nestled nine embroidery projects that are currently underway in my life. There is a tenth project set up on a frame and stand, with all its contents in a separate box, but all in all, when it comes to getting any stitching actually done, that basket above represents everything I’m working on. Taken as a whole, it doesn’t look like much. It’s just a lightweight large nylon basket that I picked up at a store for about $5. It’s large enough to hold large projects and small, but light enough to be easily moved and small enough to situate in an out-of-the-way place that doesn’t contribute to household clutter. In fact, it stays at the foot of my bed in my bedroom. No one ever sees it but me! Nine projects in one basket sounds like a lot. And if all the ingredients for those projects were dumped into the basket, it would be a lot, and it would be pretty messy and disorganized. So I use a variety of different types of bags – ziplock bags, mesh zipper bags (like the ones shown in the photo above), and the like – to organize each individual project. That way, when it comes to working on a specific project, all I have to do is grab the one bag that contains everything for that project and work from that bag. When it comes to instructions, sometimes I’ll have a whole book or magazine in the bag (like in the bag above). Sometimes, I’ll make a copy of the instructions and put that in the bag instead. It really just depends on whether the instructions are in a large book or something with a manageable size to it. Sometimes, if I’m working on my own design, there are no instructions. In those cases, I usually have a small notebook in the project bag, where I can take notes on the project as I work on it. Often, larger bags contain smaller bags. For example, all the threads for one project might be inside a smaller bag inside the larger bag. This keeps my threads neat. Embellishments, if there are any, might be in another small bag, so that they’re not knocking around loose in the larger bag. 1. One project in one day. I never have two bags out of that box in the same day. If I have time to stitch (which I always make time to do), I work from one project bag on that day. I don’t switch between lots of projects in one day. 2. Take it out, put it back. I have a small house. I can’t leave out a whole project and its pieces. I purposely organize my projects so that they are easy to take out and just as easy to put away at the end of a day. Sure, I might leave the project out during the day if I know I’m coming back to it, but at the end of the day – or when I know I won’t get back to it that day – I can put it away with very little effort. What I mean is, don’t share between bags. I don’t take a hoop off one project and put it on another. I don’t take one color of thread from one bag to use on a different project. I don’t take a needle from one project to use on another project. This keeps me from coming up short on something – or having to search for a tool or whatnot – when I finally have time to sit and stitch. This might not work for you – admittedly, I have a lot of tools, lots of thread, and a hefty supply of needles. But if you can manage to isolated tools and supplies for each project and not share between bags, you’ll spend more time stitching and less time looking for supplies or tools. Even if you only put 15 minutes into a project in one day, you will make surprising progress. And, if you grant yourself 15 minutes as a “carrot” or “reward” now and then – if you don’t hit the snooze button, if you finish a chore quickly, get that walk in, skip the coffee shop and go straight home from work, get dinner done early – whatever! – you’ll find more pockets of 15 (or more) minutes here and there throughout the day. Even if you only put in a few stitches every day, you’ll see rapid progress on a project – much more progress than you’d see if you go stretches of time without stitching anything! If you keep your projects individually organized, you’ll be able to grab those 15 minutes quickly and make more of them, than if your projects are unorganized and not ready to go at a moment’s notice. Any ideas for project organization, that can help people make the most of their embroidery time? If you have any, feel free to share them in the comment section below! I’m not nearly so good at keeping the projects separate from each other. (Crossing the streams, as it were) But, now I have a goal to aspire to. Thanks for sharing your system! I have a patchwork tote for individual projects and I embroider the name on the tote. I include lots of deep inside pockets and use zip lock baggies for little items that might get buried in pockets. Your Stitch Sampler ebook pages and all supplies rests in one! I think I will look into using those wonderful mesh zipper bags. Should be easy to make. I look forward to viewing these comments for more ideas. I love the mesh zipper bags. Nordic Needle is also good source of mesh bags – they even have colors. Good post! I like your honesty and I sympathise with it. I appear to be Queen Elizabeth of the Organised Kingdom, but that doesn’t always mean getting anything done! =) My things are always almost painfully tidy, but that’s a whole different matter from getting on with any given task, no? I too have a small home – just the upper floor of a probably less than 1000sq ft house, so I think we have something under 500sq ft of actually liveable in space (we don’t use this measure in the UK so much). I have an Ikea painted box thingie in our multi-use living room in which I, like you, keep projects in individual bags. Well, I keep the threads etc for each in individual bags (just cheap, blue, plastic sandwich bags normally) and the WIP near to it. Needles are always in one, general needlecase/book and I may have to ‘borrow’ frames at times as I have a limited number, but still more than enough. At the moment, there’s not much in the box as I’ve finished up a whole load of odds and ends that needed mounting etc and then got the two embroidery projects framed back up and ready to re-start work on. I just left the stuff for some more small hardanger pieces on there so that they’re ready to use again when the fancy next takes me. I don’t like to have more than two decent sized WIPs at any one time, although I can run one or more small things, some knitting and even a time sensitive piece alongside those. I find two works best for me so that there’s some element of variety, but few enough WIPs so that things get finished within a reasonable time frame. That’s how my textile life functions. I really need to update my blog – I have 6 projects and 9 lots of finishing/mounting to report on. Oooof! My LNS owner recommends taking one strand of floss and working it per day on a project you are stuck on. You may use 1,2,3,4 or all 6 strands, but one whole length gets done. I find it usually leads to a couple more strands and voila it gets done eventually. I keep my projects in plastic envelopes if large or plastic bags (these fit in my purse 🙂 I have on the road projects and keep big ones at home. The projects go in a large basket, near my stitching chair. Very good point about borrowing things from one project for another! I have so many projects!! I have been keeping projects in individual bags for a while now, but not with scissors, and other tools, in each bag! Now I won’t have to hunt for them, just grab a bag and start stitching. Happy New Year, and God Bless You! These are all great ideas, and I would like to add one more. When you have a project completed, put away all the ingredients/supplies. Nothing is more satisfying than finishing something successfully! And then there is an empty bag waiting for a new project. I also have a very small house, and lots of projects on the go including embroidery, knitting, sewing and on and on. When everything is organized using my method, which is essentially the same as yours, I can choose the right project for the time I have. Simple knitting in the evenings when I am tired and have to work with artificial light, more complicated stitching during the day, and something very straightforward, even repetitive, first thing in the morning while I mentally plan my day. Organization is key!! I share my time with multiple types of projects, not just embroidery, that include quilting, rug hooking and knitting. I try to keep everything required for a project in one container, usually a plastic tote or box. I wish I had enough pairs of scissors to keep one with each project; unfortunately I must share them between projects but I can keep a pair with the current active project. My first criteria for organization is where the project can be done. For example, most of my quilting has to take place in my sewing room; knitting is a project in the car for long drives. I check the calendar to help me decided when I can work on which projects. I watch TV after dinner with my husband so I always have a handwork project going that I can do then; I meet with a rug hooking group so there is some dedicated time for that; my quilt guild meets once a month and knitting during meetings is common. Once one project is completed, I take time to make sure that another is organized and ready to take its place. The system isn’t perfect but it does help to ensure that I always have projects ready to work on when I have the time. I have a “bag packed” at all times. I embroider quilt tops one block at a time. Breaks at work, waiting in the car for someone, TV watching, and visiting with company are a few times I “multi-task”. But my favorite time is to go to the Thursday Night “Stitchen Party ” at work. Anyone employed at our firm can come with a stitching project. And you can bring a friend too. We share our projects and show and tell. If you like someones else’s project and was to learn how or want a pattern we share that too along with encouragement for anyone just learning skills. “Some” of my needle work is organized in loose leaf binders. Clear pencil cases can be purchased (esp. when school supplies are first out in August) with the holes along the side so that they can be snapped into the binder. I have small binders and larger binders – the small ones I use for smaller projects, etc. The small ones are good for putting into a purse or bag and are easy to take with you when you will be waiting for kids, husbands, etc. I keep a large tote bag next to the sofa where I sit, which contains several gallon sized zip bags holding each embroidery project “in progress”. I do keep the tools in a separate bag so they will be shared as I work on a particular project. Honestly, I don’t know how I’d manage any sewing/craft project without ziplock bags! Embroidery, jewelry, cuts for quilts, paper craft projects, and even bulk purchased spices are organized in zipper bags! I love your ideas of the bags….I too use this method but unlike you I work on one project at a time till its finished. I just can’t bring myself to start a new one before the current one is done as I know myself…..I will end up with UFOs for Africa! My bags sit in a basket next to my chair so everything is easy to pick up! I have a metal tea cart. The top shelf has my ott light/light box on one end, as well as my LED magnifier clamped to the leg. The light has a tray with spaces for items I am currently working with. I have a magnetic threader and scissor holder stuck to the top of the leg for easy access. On the top are also storage drawers that I keep various project items in. The second shelf holds a carousel with needles, threaders, thread heaven, pencils, needle pullers, specialty scissors, etc. I also stow my hoop or frame here when I’m not working. The bottom shelf has a couple of pretty boxes with threads in them…just in case. I can wheel the cart in when I want to stitch or wheel it out when the grand kids stop by. I can have several projects going and on the cart, but I usually limit it it one or two. I find I lose interest if I have too many going at once. Getting back into the rhythm of a project is sometimes impossible for me. Once I’m in the groove, I need to stay there until it is finished and kicks me out! Hi Sharyn, would you mind sharing what Ott light model you have and the same for your LED light? And any comment regarding how you like them- or not… 😉 I’d really appreciate it! that sounds like some amazing tea cart! can you post a photo? it seems to be something I need to be on the lookout for. Thank you for sharing these ideas, Mary. I’ve just wasted time trying to find a particular shade of green I used on one piece of needlework as everything I have is mixed up in one bag. As a new stitcher I am quite greedy to learn as much as I can and separating your needlework into project bags is a great tip! Great timing! I’ve been striving I never this direction, but am not quite there yet. I like the one bag one day rule, and hubby will like the take it out put it back rule. I am in the midst of organizing my craft room after finally moving back home, instead of having things half in RI and half in CO. Once that is done (10 hours and counting so far) I am going to implement your method. It will make both me and hubby very happy!! I love the basket with the nine current projects in it. This has inspired me to organize because I also have several projects going at one time. Thank you for sharing what works for you. I think this will work for me also. Thank you for the great tips. Organization is my Achilles heel. 1) Take it with you… I am always running to appointments, running errands, and traveling for my work. I make a point to pack a little to-go bag the night before a trip or appointment. This way, I always have a stitching project handy while I am waiting at the airport, sitting in the doctor’s waiting room, or waiting at the school to pick up my son. I get a LOT of stitching accomplished on-the-go, using my little portable project bags. 2) Be a quitter… Occasionally, I start a stitching project that I just don’t enjoy. I used to force myself to slog through the whole project. Nowadays, I just figure the whole point of stitching is to have FUN, so I allow myself to abandon a project if it is not enjoyable to me. 3) I am “stealing” your 15-minute policy. I think you are absolutely correct on this. Even 15 minutes can be very productive and enjoyable! Jeannie I love your be a quitter rule! I have found sometimes I have more than learned or experimented enough on a project or just don’t like the thing anymore, I just stop. The items that are for learning I keep in a ziplock or tote for classes for teaching and other items get ripped out or down right tossed. Somewhere I heard about a group that had a swap of UFOs (UnFinished Objects). I like the idea of quitting a project you don’t enjoy. What do you do if you love the end result, not the process? I love the results of cross stitch, hate doing it. Do you ever swap projects with someone and give each other back the finished item? I find that keeping everything in a container helps with finding time to work. My friend and I put everything needed for the project in a large plastic container with all the threads, scissors, trims and embellishments needed for the cq block we are working on. It makes it easier to travel to work and home and all you need is the one box. Needless to say it means you have multiples of everything. Our group is currently working on a one color crazy quilt blocks each month and it helps to sort through my tons of stuff and place all of the same color in one container making it much easier to find. I too keep my projects in separate bags. I use all kinds of totes and plastic bags within the totes. My challenge is to keep my work space clear – I like working at a table. But when new threads or tools or fabric come in I dump them on my table. My 2017 resolution is to keep my table clear so I can grab those 15 minutes. Or as Gay Ann Rogers often says – work that one thread. A little every day mounts up. I also have a small stitching area, it is a corner in my bedroom all set up with a comfy recliner, daylight lamp, my stand and a small drawer unit with some supplies in it. A magazine rack and a ton of command hooks on the walls. I primarily use roller bars. I have a small hole drilled in the center of all of the spreader bars with a loop of cord in it. I hang my project up on one of the hooks along with the threads on a ring. I rotate through projects so I quickly can reach up, take down the project and threads. Grab the instructions off the magazine rack and away I go. If it is a project on stretcher bars, the magazine rack I got has open sides so they fit just fine in one of the slots, if it doesn’t fit in the rack for some reason, I drop it in a pillowcase and hang it on a hook. The command hooks are wonderful because I can quickly and easily move the hook elsewhere on the wall. I keep dust covers on my projects made by getting a set of pretty (and cheap) pillow cases, I put a small button hole in the closed end that the loop of cord goes through. I just slip it on the frame before I hang it up. Keeps the cats from playing with them as well. Ohhhh, I like the idea of using pillowcases to cover your frames. I definitely will be doing this. I too have cats that like to play with my ‘toys’ as well as their own. I keep my threads in the snack size ziplocs and then put them all into a larger zip bag. One of my cats, likes to make off with my threads when I’m stitching, to let me know I should be playing with him instead. Most of my bags now have teeth marks in them, but the thread is safe within. I was able to teach my cat to leave my string things alone. Every once and awhile I have to remind her, but she is sweet and quickly obeys. I like your information on organization. I have the projects in bags very similar to your bags. They are lined up on a shelf in a closet. 15 minutes. Yes, that will produce results! that is going to be my method. Don’t leave it lying around unless you will be back at it. I really like your organisation skills. I like the way you pack all the project embroidery equipment in one bag including the accessories, that is really good time management, you don’t have to go searching for various tools before you start your project and I like the way all your present projects are in one convenient place. I’m a one project at a time gal, I would get really stressed if I had several projects on the go at once. Usually it takes me a long time to finish a project so I really just keep it to one project at a time. I do agree that 15 minutes at a time is a great way to make progress on a project rather then leave it for when you can spend longer time on it. Thanks for sharing your embroidery time management with us and the tips and techniques on how you organise your projects, very helpful. Great idea to have the tools in a separate box, Velvet, ready to use! Like you I use large zip lock bags, depending on the project I will also use the plastic project containers. They are easily stacked on a shelf and at hand. In these are the directions (book, magazine, copy, etc), all threads needed, small scissors, thimble, needle case with different needles. If it’s a stitchery with a lot of different thread colors, I will make use a sheet of paper with a piece of thin batting stapled to it and have the thread number and symbol listed and have a pre-threaded needle ready to go next to it, that way I don’t have to stop and retread a different color all the time. This is really handy when doing counted cross stitch where a lot of color changes are necessary. When doing counted cross stitch, I have found it is easier to make a copy of the design, then as the stitches are completed, color in with a yellow high-liter, you always know exactly where you stopped. I agree, what works for me may not work for other people but I’ve used this system for years. I even use the container system for quilts that I want to make, put the pattern and all the fabrics (uncut) in a container and it’s ready to start and great for keeping all the blocks as they are completed. I particularly like the “no share policy.” I tend to borrow from one project to use in another. After a time, I lose track of threads etc. then waste time tracking them down! One of my best time management tools is a simple magnet. Do I remember to use it? NO, I DO NOT!!! And I don’t know why I don’t because I have spent precious time and skin integrity looking for that needle that I carelessly set down or dropped. Hence, a simple magnet sits near me so that I always know where I have set down my needle. Love the article about organization. Your suggestions can be used for other craft/hobbies. I especially like the 15 minute policy, though I try for at least 30 minutes a day. Approximately what size is the big bag that the smaller bags are stored in? I like your system and would like to try it myself. Thank you so much for sharing! Leland, I have found the white mesh bags as large as about 3 feet by 4 feet… Bags that large demand that the contents MUST be subdivided into smaller bags, with some of the smaller bags again being further divided! Ad infinitum. I love LNS, but where I am now the closest one is about 115 miles, each way! By thinking “outside the box” I come up with other ways the item that I want to purchase might be used. Then I start narrowing the description in a search engine, striving for some place closer. As needed I will change the “white mesh bag” to something like “mesh storage bag”. EXCELLENT suggestions for organizing especially your 15 minute policy. I have tried the following method for organizing projects: purchased a number of the conservation acceptable plastic scrap booking containers, one for each project to rotate them through the week, one a day. I have failed miserably because I will get absorbed in one or another and want to stick to it. I do have a needle work bag the contains several projects in plastic bags that are my ‘hurry up and wait’ projects that go to the MD, DMD, or garage with me. I have several sets of ‘tools’, one for each place I work and one in my purse so that I have the necessities at hand. I have started using a plastic photo conservation box for the threads etc. for each project. Roberta I think you hit on the biggest factor — self discipline. The best laid out plans cannot take root without it! Actually we can’t even begin without the desire for it. Thanks! Hi Mary!! It seems very easy to follow!! I love your tips!! Surelly I´ll intent to do it!! Love your organizational strategies. Although I pretend to be retired, I substitute teach and tutor almost every weekday. During the school day, I have pockets of time here and there to stitch. To make the most of these bits of time, I have a bag with only one project that I can make a bit of progress on. It is a self-contained affair exactly as you described. I stitch over coffee and chatting in the teachers’ workroom. Staff members love to check my progress and are astounded at how little threads and fabric magically turn into something quite grand! I have recruited new stitchers and rekindled previous stitchers in this way. What a good ideas. I plan to adopt them as a project for the new year. I have a flat box with a magnetic strip in the bottom that I keep my needles and scissors in. I keep my projects in separate bags similar to what you do Mary, but that box has my tools in it. That way I can keep my scissors and needle threader handy for whatever I am working on. I couldn’t agree more with the 15-minute “carrot” system. Have been doing that for years! Not only does it make certain that some stitching at least will get done every day, but it also serves as an incentive to tackle those cleaning jobs I really don’t want to do. I do pretty much the same things you do to organize my projects but I try to include a pair of reading glasses in each bag too. In the past – before I had a million sets of everything! – I put the glasses, scissors, needles, threaders, etc in a separate bag. When I wanted to stitch, I just grabbed a project bag and the tool bag – not too much trouble for anyone who doesn’t have 10 pairs of glasses and 10 pair of scissors. For finding time, I rotate projects. Set up 5 or 6 projects and rotate working on them a couple of hours at a time.when you finish one, add another project. It’s surprising how many orojects you can finish. I’ve also gone through my UFOs and pulled all the ones I could finish in an hour or less like the pillow that just needed 4 buttons sewn on. Wiped out a bunch af things in just one day. That was exciting! I have a multi task sewing room that is divided into sections. There is a table I use for my embroidery projects. I have an Ott light, and all of the supplies set up for whatever project I am working on. Next to the table is a caddy that holds threads, needles, etc.. I like to finish one design at a time, so this is the perfect setup for me. I had a friend who swore that some psychologist said somewhere that 100 hours is “Switching time”. By that she meant she worked on a project and logged her hours in a small notebook. When she got to 100 hours, she switched to a new project. You can pick any number of hours you want, the point is she had a system of logging and moving on to another item so she never got bored with one project and abandoned it. One of the events I look forward to every week is my Tuesday night sewing group. It’s a great opportunity for a group of women with a sewing hobby (or addiction) to get together and stitch. We meet after work at a sewing store (Shepherd’s Needle, Little Rock, AR), and stitch until 7:30pm. In addition to getting some concentrated stitching time it’s also great companionship, lots of laughter and lots of sharing tricks and tips. Wonderful suggestions! I, like many, have several projects going at once. I do keep them separated in specific containers (material, pattern, thread). But I love your suggestion regarding “Don’t Share”. Here is were I have run into problems. Before I can begin working I must look for common items shared between projects. I will then begin to work and sure enough I have forgotten something, then I’m up again looking! Currently I use a single bag that is supposed to house common tools, clearly this hasn’t worked. Thanks again for your insights. All the best in 2017! Excellent article – thank you! Much needed in my house! One question tho – do you work on one project til finished, or do you work on two or three a bit at a time? I tend to have two or three going at once – one large one, one or more small ones – and at times it seems nothing gets done. Just curious–how many projects do you work on simultaneously? I keep feeling like I should plow through one at a time, but it sounds like both you and other readers switch between various projects, and that sounds somewhat appealing to me. What are the pros and cons of working on multiple projects? Great idea. I really needed to hear the 15 minute policy because it is easy to believe that a small amount of time will not make a difference. Love these ideas! I do find that I have one “treasure chest” with needles, scissors, and other essentials but not threads or other project specific items in one place and take that out with each project. Saves on having to have many prs of scissors, needles, etc. Hi Mary, I like you keep my projects in seperate wallets with the threads and embelishments, but I don’t keep the needles or scissors with it. I’m going to try to ensure that I have a mini set of needles for each project and wax where needed for my Goldwork. Thank you, I love to receive your emails and I always try to learn from them, it helps to know that you are there. Thank you, Mary, for sharing these tips. I especially love your Bag and Project Policies. I need to work on #2! Also, I’m going to try your 15-Minute Policy, since I’m guilty of thinking I need a big chunk of time to get anything done. Great minds think alike. I organize my projects very similarly, usually with the zippered plastic pouches that linens are sometimes sold in. I find that organizing the projects that way also allows me to do things like grab a project on my way out the door to my kids’ practices or a doctors appointment. Some delicate/fine embroidery I only do at home but most projects I can pull out most places I spend time. Also, I try to work on two projects a day- the first fifteen minutes I sit down at the end of the evening, I try to work on a “stuck” project or a project that is at a certain point I hate (like outlining cross stitch). Then I’ve “eaten the frog” and I go on to the project I am most excited about (usually the start of a new project- I much prefer starting to finishing :)) I don’t worry about it if I’m grabbing time out and about, but when I’m sitting down in my regular spot to relax and watch TV I try to finish up projects as I start new ones. Thank you for your comments, they will help me to be more organized and do some progress on my projects. Thank you for the great tips for time management. I for one tend to make a terrible mess in my sewing space. It’s not big so it gets upside down very quickly. So my tip is : clean up after every stitching session. I know it’s not easy, but that’s the only way I found to keep everything neat. I loved your idea to put several projects in different bags: I have needles, threads, hoops, scissors . So I am going to get started right away and put these projects in bags. Because like you said I waist so much time looking for stuff. Thanks to Mary and everyone in this comment area that has posted “what works for me” ideas! I have always been a person who needs to finish one project before starting another…but for 2017 one of my resolutions is to step out of my comfort area and do two … or maybe three … projects at once! These are fantastic ideas from everyone! I am rushing out right now to buy plastic zippered bags and extra scissors and…lots of duplicate tools so that I can “keep the tools that you need with each project.” What great ideas! Thank you thank you thank you! Thank you for this commentary. It makes sense to me. I will implement several of your strategies today! By doing so, I expect the change in organization will lead to an outcome of increased stitching daily, fewer UFOs , and WIPs becoming completed projects. I use a similar method to you, except I currently have three projects on slate frames and one blanket, so a small bag isn’t necessarily possible! For each project I have that I am actively working on (as opposed to those that I started but aren’t likely to be worked on in the next few months for whatever reason), I have a bag with everything I need for that project, including scissors, tweezers, thread, spare hoops, practice fabric, pattern, pencil etc. Then I just pick up that one bag, and either it has everything, or I just need to add the monster frame or blanket. I have such a huge supply of semi started projects that I find this is one way of getting through them. And, I have a good mix of ‘easy’ and ‘hard’ projects, so if I’m exhausted but want to stitch, I still have something I can pick up and do, just as I can if I want to work on something more serious! I organize my projects like you suggested except that I keep my tools: scissors and needles primarily together in another pouch that I also keep with the project bags. I do that because I only have one really good sharp pair of scissors and my needles are kept in my mother’s needle keeper. So, I pull out 2 bags; slip the tool pouch into the project bag, and I’m off whether to join friends or sit in a comfy chair in my living room. The thing that I have difficulty keeping organized (and remembering) is where ideas &/or instructions for future projects are. Thank you for sharing your system Mary! It has been fun also reading through what everyone else does as well. I LOVE to organize and if I’m not careful I end up playing with the materials and moving them around more than I stitch. Right now things are a bit of a mess because we had to move all of my supplies out of the spare bedroom so we could rip up the carpet in there. So it will all have to be put back and I will probably tweak my system a bit and maybeeeee purge a few things. I also get caught up in the thrill of starting a new project and don’t do so well on the follow-through to finishing. So I have multiple tote bags that are holding “works in progress” and a few that are holding “works to start next” and there are probably a few bags of “forgotten works” LOL Like you I keep every project in its own bag with the threads, pattern & materials and if I can, scissors. One bag is for guild meetings that hold projects that don’t involve complicated counting – I find I have to rip out when I get home because I have been chatting too much! I also have a small makeup-size bag in my purse that has a small project in it for doing while waiting for the kids at swim practice or dance class or whatever. Also something uncomplicated. If it is a cross-stitch project, I usually start it at home and do the whole project in half-crosses first, that way when I’m out and about I just have to finish the crosses and don’t need to look at the chart. That makes it a whole lot easier to work on in short increments of time! Right now there are wool penny rug circles in there and in future I might start to make yoyos – a friend just made a gorgeous quilt and I am very envious of it. See, there I go again with the starting! I like the 15 minute rule and the one-strand rule! Those will keep me moving forward. I am going to put at least one project near my computer desk so that when I find myself mindlessly surfing and scrolling, I can stop myself and get to work! Mary, your time management/organizational message was an inspiration to me. I love the “no sharing” idea. A good project organization tool for me is to thread a needle for every color/symbol on the chart which saves time threading the needle each time you change color/symbol. I found this very useful. I struggle with organization, and this gave me ideas for simplifying some things. Thank you. Thanks Mary. I think I’ll take this idea aboard for my New Year’s Resolution. When I do get time to stitch, I spend half the time looking for things. This sounds very like what I do with my projects – I have an antique sewing stand where my works in progress are stacked, in individual bags. The only things I don’t do are have scissors or hoops in every bag. I don’t have enough, so I have to share! In the time management area, I go weeks where I don’t stitch, because I don’t have time. I need to employ the 15 minute rule. Good Heavens!! I have the exact same bags with my embroidery in them but I keep them on a shelf under my desk. I think I need to colour code the bags as I find my self ‘rummaging’ to get what I want. Thanks so much for sharing, Mary. I think organization is EVERYTHING, especially if you craft and have a full-time job. I follow a very similar tactic as you, though because I do other crafts as well, space becomes an issue (always a work in progress; mostly prayers that I not be so craft greedy!). For embroidery and other needlework, I tend to use baskets with all I need for several projects, but with the same idea as yours (leaving it on a shelf and taking one project out at a time), though I LOVE your idea of “Don’t Share”! I’ve wasted so much time looking for tools because of crossover. Spending a few dollars is worth having everything you need in one place. One of the gifts I designed this Christmas for a needleworker friend who uses hand-dyed floss in her original designs is a linen folder that is about 8.5 by 9 inches. It’s basically composed of a cover (I embroidered a design on it); an inner page with a pocket for a chart and small hoop; a needle book, and a small scissors holder (both of which have motifs from the cover embroidery on them); another inner page that has upholsterer’s rings sewn to it for the hand-dyed floss; and the back page. I inserted lightweight cardboard covered with thin batting inside to give the folder a stiffer body and it closes with a snap. For a small project, everything is gathered in one place and easy to slip into a tote bag if you’re traveling or going somewhere where you’ll have to sit and wait. I think the key is having everything right where you need it. Then you can make the most of your 15 minutes of stitching and not waste time looking for what you need for the project. Organization: A great way to begin the New Year! I do my projects in different ways and circumstances so storage has to be based on that. I have a set up I use at 1770s reenactments for a reproduction seat cushion (which will never be on a chair) which I work on at reenactments. Due to the nature of same, working on it has to be set up to be more period than not. I have a small round wooden box that I keep the piece (yes, folded small to fit), a number of wooden and horn reproduction thread winders with the colors I worked on at the last event – I mark these with a tiny paper with the color code info with a straight pin (the ones that come in men’s shirts if they are silver in color including the ball at the top are good stand ins for period pins). I set up the colors before each event for what I plan to stitch at that event. I have a small wooden hoop in the box and a larger one outside of it in the wooden bench/box we bring to events. I have embroidery scissors (well actually nail scissors as they were the closest I could find cheaply to pass as period scissors. I have needles in a needle case. I keep the kit instructions and rest of the thread (on Loran cards) in a ziploc bag in the larger box. If I am working on something repetitive (such as border) I do not need the instructions. If I will need instructions I photocopy the section I plan to work on and cut the piece I am doing so it can be hidden in the round box easily and referred to. The scissors are on a ribbon to hang from my waist as are a pin ball (pin cushion) and thimble case with thimble which are all stored in the round box. The latter two and a pretty piece of bees wax (still need to put a ribbon on it) are not necessarily used, but are what I would have had especially while stitching. (The hoops have screws, although they should not and should be mounted to stand on the table or the floor as I do not have an appropriate hoop. I have some thin hoops from the mid 1900s which have no screw and I use if we do an event with our national organization as screws are prohibited there. I have the projects from my EGA chapter. These are in 2 categories. The ones I am working on are in ziploc bags in the tote bag I bring to meetings. Each has its threads, instructions, etc. in the bag. Some have their hoops, sometimes I need the same hoop for one or more projects – or my husband needs a hoop for his projects. We do have some duplicate hoops. 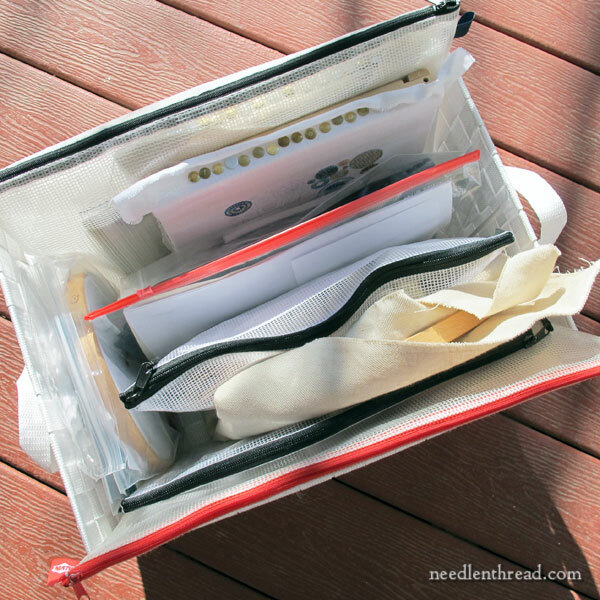 I do not keep scissors with each project – there is a small plastic box in the tote bag with scissors, pins, pencil, small ruler, white sewing thread, and other general sewing items. The EGA projects in the past that I hope to finish one day are in similar ziploc bags in a shopping bag next to my studio work table. My personal projects are in my “in progress” drawer. When we set up the studio we bought a desktop size (not the tiny ones) 3 drawer plastic piece which we put on a conveniently located dresser. We each have a drawer for work in process to be easily dropped into and the third drawer is currently used for most household glues. I have a holder made of fabric I made some years ago – it has 3 large pockets inside and two smaller ones on the front. Each of the inside pockets can hold a project or a project can be spread over more than one – for one large project I kept the project, hoop and color thread I was using in one pocket and the remaining colors and chart of which color was for what in another. One of the smaller pockets is sized to hold embroidery scissors – it can hold up to 3 pairs easily. The other small pocket holds needle packets, etc. It was originally designed to be grabbed and tossed in a suitcase for travel. I usually have two or three projects I’m working on at the same time (not to say I don’t have 6 others started and unfinished) so I don’t get bored with one or the other. Much the same as you’ve described, I keep each project, instructions, books, etc. in a zip lock bag which I keep in a large canvas bag. Each project is either on a hoop or stretcher bars and ready to go. Almost everything is in there with the exception of scissors, magnifyer, portable light, small zip lock for ORDs, and glasses. These items go in a small black canvas bag. So if I am going portable, I will grab the black bag along with a project bag and I’m good to go and won’t forget anything. This more addresses organization than time management. I rarely have any deadline driven projects. But my time to stitch sometimes comes before anything else. Him: “Honey, what’s for dinner?” Me: “I’m stitching; not hungry. Make something for yourself.” Hahaha. Happy new year everyone. I tell my myself that I will work one thread worth of stitches in an evening to help me move big projects along. It is surprising how much you can get done this way. Thank you so much, Mary….I do use some of your ideas, and really like the 15 minutes sewing idea. And the mesh bags sound really helpful. I do have 4 or 5 projects I am working on now. And so many more I want to do. My problem is I like to quilt too. I love all the things and tutorials you have available to help us. I am doing the long and short stitch and appreciate the patterns and the tutorial to use to help with the learning. I like your idea of “not sharing”. I do this with needles. I don’t have enough tools to put one with each project but I keep all my small tools in a transparent plastic box thats 6″W x 4″D x 1.5″H. Another box the same size has needles of all different types and size plus a light and dark neutral beading thread. I take these 2 boxes whenever I go anywhere I go and I know I have everything I’ll need. I also have 7 x 5 x 2 transparent hard plastic boxes that work great for small projects. I have zip locs in all different sizes from 1.5″ x 1.5″ to 4 x 6 and use that for the little stuff that goes into the project bags/boxes. I do a lot of different techniques and I have projects boxes for a technique. I use snap tight boxes in 3 sizes with handles. Handles are a must . . . it’s so much easier on my back. For example, one box is for dorset buttons and it has the threads and button forms and a book and some internet instructions. I can grab that, put my needle and tool boxes inside and I’m reading to go to Fiber Friday at my local Weaver’s Guild. I have project boxes for gold work, resin, kumihimo, felting, etc. These project boxes sit on Metro Shelving in my Studio. I work in my living room so it’s easy to grab a box or a single project and get to work. I would like to wish you a Happy & Safe New Year. And your in my thoughts, hope the worst is behind you! Thanks for the great tips Mary! I love to read suggestions concerning time management skills because I (like most of us) am constantly searching for more stitching time. I try very hard to have only two projects on the go at any time – one involving needle and threads (working on in my sewing room only) and either a knitting or crocheting item that sits beside my tv-viewing chair in the living room. Living in a small apartment means there isn’t a lot of room for too many things going on at once. Sometimes I might set aside my thread project in order to do something at the sewing machine though. Some great suggestions! I do some of these already but good info nonetheless! Thank you for your approach to project organization, and thanks to all of the commenters for their suggestions. I have far too many projects going at the same time and I tend to work on one, then put it down unfinished, and pick up another and work on it for a while. I use tote bags, which I collect on vacations. I never work from a book or magazine, but make copies of the projects to take with me. I have a small tool bag that I switch from project to project, it makes life much easier for me. I can’t think of anything to add because I organize my embroidery projects much the same way you do. I need to do this to stay focused because I can become easily distracted, which causes a messy “bag” of projects (this has happened)! I love how you readily share your embroidery life with us. Wow!! I learned how badly I am organized!! Thanks for showing me it’s ok to have several projects in line BUT your idea of NO SHARING is awesome!! I need to re-do my bags in to separate items so that I can just pick up and work! I have been told to do that 15 minutes daily but have not done so! So this new year, that’s my goal: 15 minutes and re do my project bags!! Thanks for helping out!! This is just what I needed to start my new year. I do have one other organizational question. How do you organize your DMC threads, by number or by colors of different shades? I have a list of every number/color and mark it with highlighter when I get new colors. Thanks Mary and have a blessed new year. Thank you Mary! You always have such wonderful ideas. I’m more of a one project at a time gal but you have inspired me to prepare some future projects and give your method a try. Not being an internet shopper , I did not know these zipper bags existed and made just such a one (from table cloth plastic) to house the embroidery project given me for Christmas. So see, you think into our heads and we do not even know you have! I have two spots. One is a “craft room” where I have my sewing machine, desk filled with all things beading and basic sewing tools. A side board filled with fabrics and all other knicks and knacks for various crafts. I have all my embroidery supplies in a plastic tote box. In my living room I have a vintage tapestry bag attached to a wooden frame that props open on it’s crossed legs, or can be folded up to make for easy portability. This contains my current projects and lives by my spot on the couch. Next to that is a tall roomy plant stand that serves as a side table. It holds a pretty Portuguese spoon rest that holds beads and needles and a needle grabber and various other items I use frequently. I also have a floor lamp right there for extra light. I like your ideas – I have a lot of unfinished things around some grouped together but not to this level of organisation which I could see really helping me to finally finish some. Thanks! Happy New Year to you, and may you enjoy better healthin 2017. Like you I like to keep different projects in mesh bags, although I’m not a prolific embroiderer like you. Some of those bags stay on the ‘to do list’ a long time, but at least I have all the threads in the right colours at hand when I eventually pick it up. When I go to the great reward(all the stitching I can do) my survivors will wonder what I was thinking with all the bags, all with the same sort of stuff in them. I too keep everything I need in a zip lock with everything in it. I must have 100 laying tools, only God knows how many scissors and way too many cutsie magnets. That way when ever I snag a few minutes all I have to do is pick up a bag and stitch. Sometimes I even finish something. I have a similar system – though not as many projects! – but I don’t have lots of scissors, etc. So, there is one bag with tools in it – scissors, needle keeper, needle conditioner/beeswax, tweezers, specialty needles, etc – that gets pulled out with each project. And the tools ALWAYS get returned to their own bag, so I can always find them. Love the idea. I’m working on organizing all of my needlepoint projects. So far, all of the treads/needed embellishments are with each project. Because I have numerous ones going at the same time, I have duplicates of threads, beads, etc. I NEVER borrow from another project because then I’m missing something in the one project. So far–it’s working out pretty well. Dottie, I am a needlepointer too and a friend had a idea which made so much sense. We were working on the same project which had four colorways; autumn, summer, spring, and winter. I had finished autumn and planned to go on to summer. She had done summer so we swapped our leftovers. We may have to buy a little extra thread but kits seem to provide twice as much as needed. I hasten to add, we bought our own patterns so the designer was not deprived of her royalties. I keep all my tools in one bag for things like this, which is taken with the pieces. I also, however, keep a small toolkit in my purse with needles, thimble, laying took, and scissors, and a foldable scissor attached to my keys. Otherwise, I do the same thing. Hi! I don’t have as many tools and needles as you do, so I use a necessaire with pockets where I keep all this stuff organized and put it in the bag! You have great ideas for organizing projects and stitching even if it’s only 15 minutes! In my system, I have zipper pouches for each project; however, they are not in one place. I will get a basket to put them in. Each pouch has the project (if it fits), all threads, and instructions. I do not keep tools in the pouch unless it is specifically for that project and isn’t needed in another one. For tools, I keep two zipper bags, one for embroidery projects and the other one for needlepoint projects. Some of the tools are duplicates of the other bag and the rest are specifically for either embroidery or needlepoint. Lastly, I have two small zipper pouches with needles, threaders, and needle minders; again, one for smaller embroidery needles and the other for larger needlepoint needles. I also have two stands to clamp the stretcher bars to; one is a metal lap stand with clamp (or switchable roller bars) and a floor stand for bigger projects. To take projects with me, I have two quilted bags; again one for smaller projects and one for larger projects. I keep the tools in the appropriate bag along with the needles and the “current” project. Then I can grab just the quilted bag and I’m on my way to a stitch-in, guild mtg., or class. The only thing I may have to do is put a different project bag in the quilted bag and I’m off! Thank you for all the tips and tricks, instructions, and information you provide. Though I usually work on needlepoint projects, a lot of what you cover can be translated to needlepoint. One other tip I follow, when I stop working on a project even for a few minutes or hours, I always thread up the next needle and if possible do one stitch so I can just begin stitching the next time I have a few minutes! Best wishes to you for the coming year! May this year bring you good health (cancer free! ), happiness, prosperity, and tons of stitching time! I keep projects in a ziplock bag (or their original packaging if possible. I don’t have your supply of threads so I do occasionally ‘borrow’ (but I note on the borrower’s pattern where that thread needs to be returned to) if it’s only a small amount. If I know I’ll need most of a skein (or more) they do get their own dedicated skein. Beads and specialty fibers may get their own bag in the bag. Tools stay on the project or on my music stand. I have put together a tote of small projects to take with me out visiting, it’s acquired it’s own pair of scissors, needles and needle threader so I just grab and go. I just read your “bag projects” article. Loved it! I only have one comment or suggestion for others. I only have one pair of embroidery, gold thread scissors, one or two needle threaders, needles and a laying tool. I found when I first began to stitch, a zippered pouch that had been a tool holder from something my husband used to use. It has several pockets of different sizes and I can use it for all the items I need whenever I sew. So whenever I want to embroider something, I always have my sewing pouch that contains everything I need including the above mentioned items and, needles, tape measure, crochet hooks (I find useful for short thread ends). My suggestion is to look in unusual places for separate pouches with separations or pockets to hold all usual stitching supplies and use it for all projects. I have given away many various pouches to the Salvation Army, Good Will etc, they have been one of a kind that other items have come in. Consider designing a rolled pouch to which you attach “pockets” for holding the usual items we always use, place items in it, roll it up. Attach ribbons at each end to tie it together. Look – you have all sewing items needed in one place. It’s very handy. Well you have answered inadvertently a question I have had. I see so many projects to make needle books and think some of them are so pretty, but how many can one person have/make? For you it sounds like at least 10 and anyone doing a projects like you do, as shown above need a way to keep your needles handy and in good order. I can see where having more than one pair of little scissors is important as well. I try to have one pair by my embroidery machine, and had a pair with my box of hexagons that I am working on, and then yet another pair with my embroidery supplies (that are in a rolling cart), but there are times those scissors aren’t where they are supposed to be as they were borrowed to use elsewhere. Since it is just hubby and me, he knows better than most that my littles scissors aren’t to be touched, as are my big fabric scissors, so I always know it was me moving scissors around. Up until the Christmas crush hit, I had been trying to work about 15 minutes a day if I could on a quilt I am piecing and you are so correct in that you can get a lot done in just little segments like that. Now just to get back to doing it for both my quilting and/or embroidery. While reading some of the other comments, I had one. I have to get an IV every 6 weeks that lasts about 2 hours more or less. Anyone have any hints on stitching while you have a needle stuck in the other side of your elbow (your antecubital)? I usually just read, but it would nice if I could stitch some days but the arm with the needle can’t be bent, or maybe I have to bit the bullet and see if they can find a vein elsewhere in my arm so it isn’t so positional. Open for ideas. Maybe one of those frames that sit in your lap or slide under your leg? When I had to get an IV for three days each week for several weeks, a PICC line was put in. I have very deep veins and the IVs often had to go into my feet or hands, so yay PICC line! Anyway, it didn’t hurt at all and they use an ultrasound to put it in and it can stay put for a time. I don’t know if this would be an option, or maybe one of those chest ports they can put in?, but I don’t think you should be in such pain! Whitney, Thanks for the idea, but they wouldn’t insert a Piccline for this IV when I have infusions so far apart. I was a nurse before I became to disabled to work anymore due to Rheumatoid Arthritis and understand the care and treatment of IV lines. This IV actually helps relieve my pain although this winter weather isn’t helping much. If you see those commercials with Philip Mickelson and the cook etc. taking enbrel for their “moderate to severe” arthritis, that is the idea behind my IV only a different med, however, I’m supposedly classified in the severe RA camp and if they are as well then I am in the XXXXsevere RA one! I would love to be able to walk from one whole to another, not that I play golf, and he is doing tournaments! Perhaps his was caught in time. Me, I’m not in good shape. Hand work currently is very hard for me as my fingers hurt so bad and are getting so twisted up, but I still want to particiapate in things I love – needlework of different sorts. One of the things I do try to do to manage current machines piecing for quilts is push myself to stop at a point that I can set up to go to a next step when I come in. Like I have pieces partially pieced that need the seams pressed as my next job for the quilt I am currently working on, so they are all ready for that instead of leaving a long tail of chain pieced pieces laying in a jumble that have to be snipped apart before I can do anything else. I too live in a very small apartment now & the Put It Away rule is one that makes a very big difference in clutter & keeping projects clean, neat, & tidy. I bag my threads inside a larger bag that holds the pattern. For needles, thread conditioner, tiny clips, magnifiers, & whatnots, I keep in a zippered container from an organizing store. My goal this year is to keep working on projects I have started but not completed, AND to not begin new projects until these oldies but goodies are done. Then again, I find that I always need an ‘easy’ project for traveling, when it occurs. I put each project in its own inexpensive cloth or plastic tote bag with handles (Dollar stores are great!). You could paper shopping or gift bags with handles. A 3×5 card is stapled to the bag with pertinent information (picture, date purchased, started, missing supplies, etc.). Basic supplies like needles, threader, thread card, scissors also go into the bag. I hang a chain from wall to wall of my craft room and use S-hooks to hang the project bags (you could hang the chain straight down from the ceiling). A little thought in arranging makes it easy to browse projects. Small go into one bag with a project list on the outside of the bag. For smalls you only need one set of basic supplies. When you’re ready to stitch, its all there ready to carry. Great post Mary. I agree, the more organized I am the easier it is to function. Even if I only do a task for five minutes it is something accomplished & seems to give a path to doing more! You know, it occurs to me that I mastered time management when I organized my projects like yours. I have a large wicker tote that carries two or three projects so I have something going which I can do in a group and others require peace and quiet. I have a little separate box with needlepoint tools and another for surface embroidery. I used to spend hours looking for things and using your tips for organizing my projects and workroom has helped me a lot. Thanks, Mary. Hi! So I despise threading. But! I found these little contraptions from Clover called, I think, “quilt domes” on Amazon. They don’t cost that much, I have more than one, and each one holds ten threaded needles. I’ve written on top of each one a letter (A, B, C, you know…) and I record which color is in each slot in each dome. I can then take a little dome with me without a threader and all of my threads. It makes things much more portable. I apologize if I’m mentioning something that has already been discussed on here. I haven’t read all of the comments, you see. But I thought that I should share in case anyone hates threading as much as me. The most helpful thing for me in your article about getting organized, surprisingly, is the 15 minute block of time. I really need to employ that concept if I am ever to get anywhere. I keep looking for a whole evening, a whole afternoon that I can devote to my project … and that just doesn’t happen all that often! But 15 minutes, yes! I have a large wooden beading tray with a velour mat that I use to keep my current project organized next to me on the couch. I use a flat plastic case that snaps shut for projects when I travel. I never used to work on more than one project at a time, but the last few years I find myself starting projects without finishing previous ones. I need to get better organized with the unfinished stitching and your tips definitely motivate me! 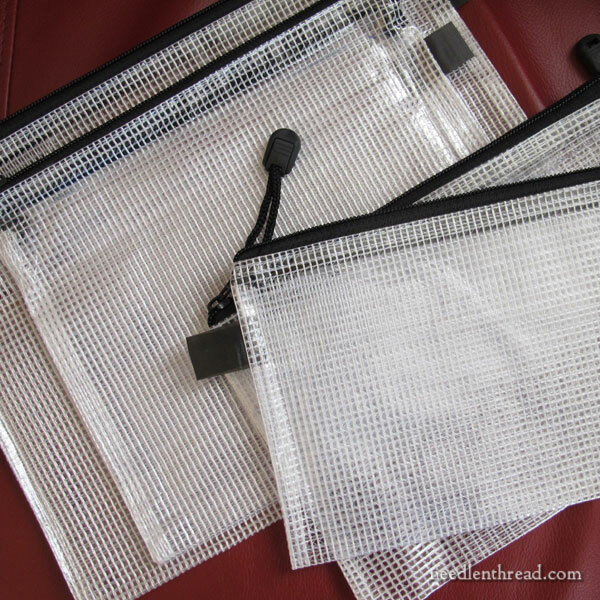 I have several of the zippered mesh bags of various sizes and love them! For me- I have to discipline myself to spend less time looking at and admiring the beautiful work of others,and get focused on my own project/s! All great advice. Regarding time management…I’ve been using a variation of your 15 Minute Rule. I started a fun quilting project over the holidays that involves appliqueing 76 birds. (!!!) While I made a significant amount of progress on my project while I was off school (I teach kindergarten), I worried when when reality struck and school resumed, this bird project would become a UFO…unfinished object. Here’s what I did: I downloaded a free goal tracker app for my tablet and made the vague “work on bird quilt” as a daily goal. Each day, I applique at least one bird and, as a reward, am able to put a check marks in the box for that day on my app’s calendar. The idea is to form a streak of check marks and try not to break the streak. Working on the bird quilt each day takes approx 15 minutes. My sewing machine stays out, so I just plug it in, grab my materials and get the quilt out (I, too, clean up my work area each night so that my project is not lying out all the time. We have cats who love to “help” me. ‘Nuff said.) I machine-applique the hand-basted bird. Then I check placement and orientation for the next bird by consulting my tablet for the photo of how I laid out all 76 birds when I began the project. (Each bird is made of a different fabric and is facing either right or left.) Since the birds are all stored in groups, it’s easy to locate the next bird and hand-baste it down. If my sewing time is up, my project is all ready for the next day. If I still have time, I applique that bird and hand-baste the next one, always leaving a basted bird for the next day’s sewing. This does not sound like much, but the steady chipping away has led to a surprising amount of progress. And I love the sense of accomplishment I get from adding that check mark, PLUS I don’t feel guilty over yet another UFO! I have most of my ongoing projects each in a separate tote bag with the mounted project, threads, instructions, etc. These tote bags are stacked along the wall next to my chair. Unfortunately, there are about 20 UFOs there, because of various classes I haven’t been able to resist, plus workshops at my EGA meetings, etc. My EGA chapter gives each new member a list of tools one should have on hand for projects, and I have those tools in two bags (more used and less used). The more used tools bag sits next to my chair and is convenient for me to take with me to stitching groups, etc. I usually work on projects for about 3 hours each night, depending on what’s on TV to entertain me while I stitch. I inherited about 20 or 30 *more* UFOs from my mother, who was even more into stitching than I am. I haven’t yet started working on any of these, as I’m trying to finish some of my own UFOs. I also inherited a UFO crazy quilt that was passed down through some family members after being started by my husband’s great-grandmother! To keep track of all of this, I have an Excel spreadsheet listing the projects, type of work (counted cross stitch, surface stitch, knitting, etc. ), whether the project is large, medium, or small, the approximate percentage of work completed on the project, and the tote bag it’s in. This can be useful for times like today, when I was trying to figure out what I could take to my monthly EGA surface stitching group tomorrow, and needed a quick list of actual surface stitching projects. I love your organization and system! Currently, I keep all my common tools in a box (scissors, needles, puller, threaded, etc.). I’ve been using a plastic tote with a handle to hold one project, pattern book(s), threads on a ring (hangs nicely nearby on my ott lite), and the tool box. I usually only have one or two going at once, but I have some buried projects that will be there after I’m buried unless I step up my organization like you’ve outlined! LOL Thank you! Thank you for the article (I think). I have sorted out bags and spent the day getting the projects started together. I now have 19 bundles plus a number of tatting projects that I have not counted. But the good thing is that some will only need 15 to 60 minutes to complete, so I now just have to follow the 15 minute rule and try not to start something else for a while. a while back my daughter and her three young sons came to visit. the two year old was eying my “work table” with glee, seeing all the things he could check out. fortunately he did not touch when told not to, but i don’t think that will work forever and i wondered what to do about it. then low and behold this article appeared in my in box. i went out and bought a small plastic tote that has a locking lid from wal-mart $6. as neither wal-mart, michaels nor joannes had the clear mesh bags, which i love, i then purchased gallon and quart sized zip lock freezer bags. at staples i found a couple of zippered envelopes (similar to the mesh bags). i have cleared my “work table” of all my projects and put them in the tote, with the exception of knitting, which has it’s own smallish canvas bag. i am in the process of getting all my floss(es) for the projects sorted into the smaller bags. as i am in the process of setting up three, count’em three, new cross stitch projects, i know i’ll be buying floss soon…lol….so in the sorting process, i’ll make a list of needed floss. also, i took your 15 minute idea to my sewing room (which i am still trying to clean and organize) so now whenever i go there, i use the first 15 minutes for cleaning/organizing. as usual you come through when i need a good idea! Thanks ever so much Mary!!! may your new year be happy, healthier and prosperous! This was great – I always have a few projects going at once. Thanks for some great ideas on organizing/juggling multiple projects. “Don’t share” is an excellent tip and one I need to work on. It saves so much time at little extra expense. Thanks for mentioning that hint. This site is so very helpful for someone like me who’s returning to embroidery and silk ribbon. Thanks for being so generous in sharing all the detailed info. It’s clear you love the subject. I’ve discovered that plastic school pencil boxes, both large and small, are great for separating projects. I use the larger size boxes for threads and embellishments and the smaller size for tools, such as scissors, Thread Heaven, needles, pins, threader, highlighters, etc. I do use separate thread and tool boxes for each project. I use blue painter’s tape to label each thread box by project. All tool boxes are identical in contents. Over time my system has morphed into a combination of several methods of organization. At home, I’m currently working on five different projects. I discovered two inch deep plastic trays that I now use for threads, tools and patterns/instructions, etc. Fortunately, all five projects fit in one tray. I use a floss finder box for all threads, but each project’s thread is is kept separate. The tray also holds a tool box, patterns/instructions, magnetic pattern holders, etc. The tray easily slides into the shelf under the coffee table in my sitting room and is barely noticeable. The fabric for smaller projects are kept in Zip lock bags in another tray. Larger projects, requiring a frame, are easily slid behind the sofa. My husband and I do a lot of traveling and I even have a separate project that I only work on while we’re away from home. It’s multi-panel (12) so the fabric pieces are fairly small and do not require a hoop or frame. However, I do use wooden craft doweling that I’ve cut down shorter than the fabric. I roll each end of the fabric on a dowel and use plastic coated clips at each end of the fabric to keep the dowels in place. I keep this project in a separate carry bag with it’s own thread and tool box. I even included a clip on light and mini-flashlight (comes in handy when you’ve dropped your needle). Instead of a magnetic pattern board, I glued two pieces of heavy cardboard together and taped the edges with blue painter’s tape. Binder clips keep the patterns in place. Everything has passed through TSA security multiple times without a problem. This is a really good idea. I have various bags, but I need to be more consistent. Mostly, I’m going to need more pairs of scissors! Love this!! I only have two project going at the moment, and the loose piles of floss, thread, instructions are a hot mess. So, I’ll be raiding my box of large zip locks when I get home! 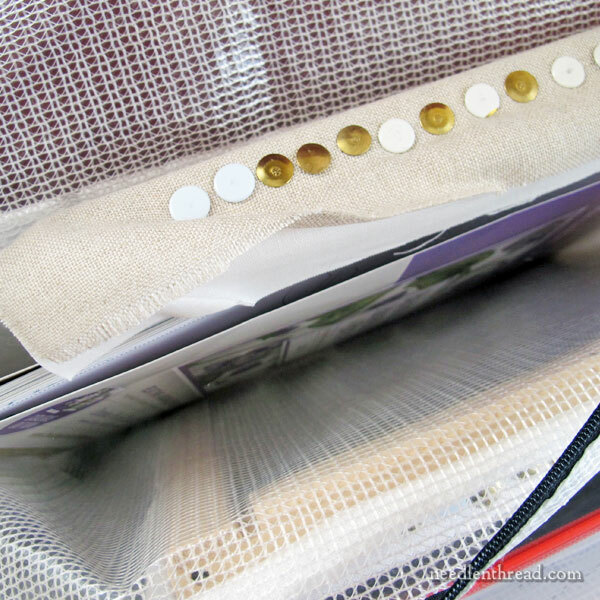 where caould I find those bags – ziplock bags, mesh zipper bags (like the ones shown in the photo above), and the like – to organize each individual project. Hi, MIP – needlework shops sell them. I’ve also bought them in Amazon, here: http://amzn.to/2vgkpca You can also find them on Amazon in multiple colors and whatnot. Hi MIP, Container Store has them, they come in three sizes, they’re fantastic! Years ago, a friend told me how to finish a project I just didn’t want to work on but DID want to get it finished. If you know you have an hour to stitch, take the first 15 minutes (or set whatever you want) and each day work the first 15 minutes on the dreaded project. If you really get into it, continue on it. If not, when times up…put it away for tomorrow and work on the more interesting stuff. After a while, you see the progress. It works!!! Mary, what an excellent idea! My variation I picked up from one of the members of the on line group “Stitcch Specialists”. I use the archival plastic boxes for scrap booking. Each box contains a project (or more ) from a designer that I am working on or plan to in turn. The general idea is to label each box with a day of the week and use that particular box on that day of the week. That requires discipline I have yet to develope. LOL If the project is close to being done, I have a tendency to concentrate on it. The idea of keeping the necessary tools with each box is a great one and much better than just having a “Husswife” for tools. That way no time is lost in remembering where you laid your kit down. I love these ideas Mary. But I am not even that organized. I take my tatting when I travel since that requires the least space and equipment. But at home I rely on my two antique Danish modern sewing stands. One I use for hand sewing and the other for knitting. The oak and teak stand has a lid that opens up so I can spread out my project. It also has removable trays that hold spools and notions. Under the trays there is a removable box that holds my fabric, instructions, hoops etc. It all closes up neatly at the end of my sewing session and looks like a small table when not in use. The second stand is made of teak and rosewood with two drawers and a pull out basket underneath. One of the drawers has dividers for spools and notions. The other drawer is perfect for needles and pattern instructions. The basket holds my current knitting project. Both stands move easily about the house with me or even onto the covered patio on nice days. I truly wish some modern woodworker would make these lovely cabinets again today. They are hard to find these days. I would be happy to share photos of my stands if anyone is interested.